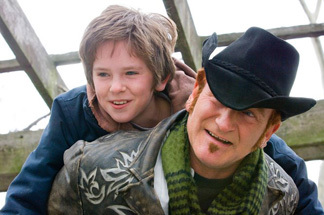 August Rush isn't anything to write home about. But it's also not anything to completely avoid at the ticket counter, either. If a film is supposed to follow all the rules and appear completely realistic from the opening credits to the slow fade to black, then over half of all films today would never end up on the big screen. But the thing is, films like August Rush make it through production and succeed — in a way — when audience members understand that what they are watching would never happen, could never happen, but are still willing to follow along with the charming — yet extremely predictable — ride. Young but already accomplished English actor Freddie Highmore portrays the title character in this contemporary fairy tale directed by Kirsten Sheridan, who is probably best known for co-writing 2002's In America. Evan Taylor, who is christened August Rush a bit later in the film, is an orphan boy who has an extraordinary — and perhaps unbelievable — talent to "feel" music around him, which ultimately guides him from his home for boys in an irrelevant New York town to the streets of New York City, in search of his parents who orphaned him by circumstance since conception. And little Freddie out acts them all, including Keri Russell and Jonathan Rhys Meyers, who portray his two parents, Terrence Howard, who is employed at a child services agency, and a miscast Robin Williams, who plays an awkward scrooge who wishes to profit from the boy's musical talents. Highmore's actions are subtle, yet convincing, as a wide-eyed, completely innocent boy who has patiently waited to reconnect with his family since the day they first separated.